After a five-day trial last November, Miami-Dade jurors found Baptist Hospital guilty of failing to administer tissue plasminogen activator (tPA) to 82-year-old Thomas Strinko and awarded the plaintiff $1.5 million in damages – even though the stroke patient had had a history of a subdural hematoma 13 months earlier. More disturbing was the decision that there had been a reckless disregard for care – a designation that extends well beyond breaching the standard of care. Meet the newest litigators in medical malpractice: Patients (and their families) denied the “wonder drug” tPA. As news of tPA therapy spreads, giving stroke candidates hope of a miracle cure, lawyers are filing suits when it is not offered. And some juries are deciding in favor of the plaintiff – even when the patient was not a suitable candidate for tPA. As the Strinko v. Baptist Hospital Miami case demonstrates, there has perhaps never before been greater pressure on neurologists to use a treatment with a more precarious risk-benefit profile than tPA. Within the brief three-hour time window allowed, the neurologist is expected to factor a vague or largely unknown past medical history into a rapidly evolving acute event that may itself be fraught with diagnostic and etiologic uncertainty. It is precisely these ambiguities that make such cases ripe for picking by the plaintiffs' bar, allowing them to select the angle needed to convince a lay jury that malpractice has occurred. 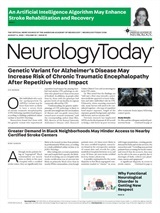 What makes a neurologist's predicament even greater, as described in the April 4 Neurology Today, are entirely non-medical factors influencing administration of this drug. (See “Stipends for Stroke Call Create New Pressures, Demands for Neurologists,” page 6). With a new DRG providing reimbursement for thrombolytic treatment, and administrators anxious to avoid ambulance diversions and promote their own medical centers as full-service facilities, more hospitals throughout the country are lining up to become certified as stroke centers. Meanwhile, patients armed with hyperbolic headlines about the “miracle clot buster” are demanding they receive a therapy for which they might well not be suited. With so many stakeholders in the decision process, and with expectations set so high, physicians are doomed to disappoint – and to be sued. Most of the tPA case law thus far resulted from allegations of “failure to treat.” Yet as tPA administration becomes more universal, there will inevitably arise more cases stemming from adverse effects, especially if physicians feel pressured to push the limits of prescribed protocols. And greater numbers of patients on tPA will develop complications likely to test the resources of average community hospitals not equipped with 24-7 laboratories, imaging, intensive care units, neurointerventionalists, surgical teams, and neurologists who live within immediate driving range. While advice to document thoroughly seems both rational and intuitive, at times of urgency, busy physicians may fail to follow through. When the Michigan Acute Stroke Care Overview and Treatment Surveillance System statewide stroke registry was used to review 2,566 stroke admissions over a six-month period in 15 selected hospitals, it was noted that of 283 eligible patients who did not receive IV tPA, no specific reason for withholding treatment was recorded. Cole, Scott and Kissane, a Florida law firm, has represented six tPA cases. Christopher B. Hopkins, a defense lawyer specializing in medical malpractice at the firm, believes that proper documentation is essential. When he defended an ER physician who had evaluated an inebriated patient with slurred speech complaining of leg weakness, the doctor informed him that he had had concerns about whether he was observing signs of stroke or intoxication. The hospital followed its protocol and the inability to fix time excluded the patient as a tPA candidate. The patient had a massive stroke and the family sued for failure to administer tPA. Hopkins, who was able to get the case dismissed against the ER physician, noted that it was helpful that his client had documented consideration of stroke as part of his differential diagnosis and made affirmative judgments that showed that he was aware of the symptoms and recognized tPA as a possible intervention. “Such documentation helps show the physician's competence,” he explained. He further recommends that physicians determine the onset of symptoms and document times and each affirmative step along the protocol. Dr. Levine said he is concerned about hospitals that decide to tighten eligibility, allowing them to “cherry pick” the patients who are least likely to hemorrhage, as well as by those that are “trigger-happy” and expand the guidelines to include unsuitable candidates. In the 2003 case of Reed v. Granbury Hospital, (Court of Appeals of Texas, Fort Worth), Reed's wife, a registered nurse, demanded that ER physicians at Lake Granbury Medical Center administer tPA. When they refused, she requested transfer to the Plaza Medical Center, a stroke center in Fort Worth. Unfortunately, Reed arrived more than three hours later, making him ineligible to receive tPA. Reed contended that because he did not receive tPA, he was significantly and permanently disabled from the stroke. On the date of Reed's stroke in 1998, the hospital had tPA available for cardiac patients, but did not have a protocol for administration in cases of stroke. The Reeds sued the hospital for negligence in medical treatment including failure to have an adequate policy with respect to referral. Dr. Sacco would like to see more qualified hospitals trained to treat stroke, but until that is the case, transfer should be arranged expediently. “Because door-to-needle time is of the essence, the goal is to provide tPA at the nearest center,” advised Dr. Sacco. “If your emergency room is not equipped to provide tPA, make sure that you make every effort to transfer the patient to one that is,” he added. Dr. Levine advises that all neurologists become familiar with their state's case law precedents. For example, in Michigan, where he gave his opinion in Ensink v. Mecosta County General Hospital, the case boiled down to probabilities: With tPA, patients are 30 to 50 percent more likely to have minimal or no disability (not clearly over 50 percent) than without tPA and the number needed to treat to have one patient improve at least one level of disability is about three (Arch Neurol 2004;61:1066–1070). The plaintiff's case was dismissed on the basis of Fulton v. Beaumont Hospital, which states that the plaintiff must show that the overall opportunity to survive was reduced by greater than 50 percent. Dr. Levine pointed out that whereas some states rule based on loss of chance, others, such as Michigan, invoke Fulton, in which the loss of opportunity to survive or achieve a better result needs to be greater than 50 percent. “Attain proper signed informed consent from both patient and family members or surrogates for both scenarios – giving or not giving tPA,” suggests Dr. Weintraub. Dr. Sacco and other experts explained that while it is not necessary to get a separate written informed consent as tPA therapy is viewed as standard of care and time is of the essence, it is critical to explain the risks and benefits to patients and to document this discussion in the medical record. Giles v. Jamaica Hospital Medical Center (Queens, New York, Superior Court, No. 24765/01, 10-08-04): When 57-year-old schoolteacher Joan Giles was taken to Jamaica Hospital in September 2000 with a history of two transient ischemic attacks, she did not receive tPA and developed right-sided hemiplegia. Four years later, she was awarded a $3.1 million verdict in her medical malpractice lawsuit against the hospital. Brooks v. SSM, F. DeCastro, MD (Missouri Court of Appeals 73 S.W. 3d 686 No. 23664, 23697): The plaintiff brought action against the hospital and DeCastro for negligently administering tPA and causing quadriplegia. The tPA was used in high dosage for underlying cardiac disease. The jury awarded $315,000 to the plaintiff but defendant DeCastro requested a new trial based on a neurologist's testimony that tPA was the cause for epidural hematoma and quadriplegia. The court of appeals found no informed consent for bleeding complications when used for cardiac reasons and also rejected DeCastro's argument. • Deng, YZ, Majid A, et al, for the Paul Coverdell National Acute Stroke Registry Michigan Prototype Investigators. IV tissue plasminogen activator use in acute stroke: Experience from a statewide registry. Neurology 2006;66:306–312. • Saver JL. Number needed to treat estimates incorporating effects over the entire range of clinical outcomes: Novel derivation method and application to thrombolytic therapy for acute stroke. Arch Neurol 2004;61:1066–1070. Neurology Today6(9):31-32, May 2, 2006.